Home / Projects / Wildlife Conservation / Lao P.D.R. Our work is not limited to Thailand as we are partnered with ACRES, a long-term project in Singapore to eradicate the sale of wildlife and end trafficking in Lao P.D.R. Wildlife Rescue and Education Center, Lao P.D.R. Our efforts are not limited to Thailand! We are partnered with ACRES Singapore in a long-term project to eradicate the sale of wildlife and end trafficking in Lao P.D.R. With support from the Lao government officials, we are working to release bears in bear bile farms into a natural sanctuary and close the farms for good. 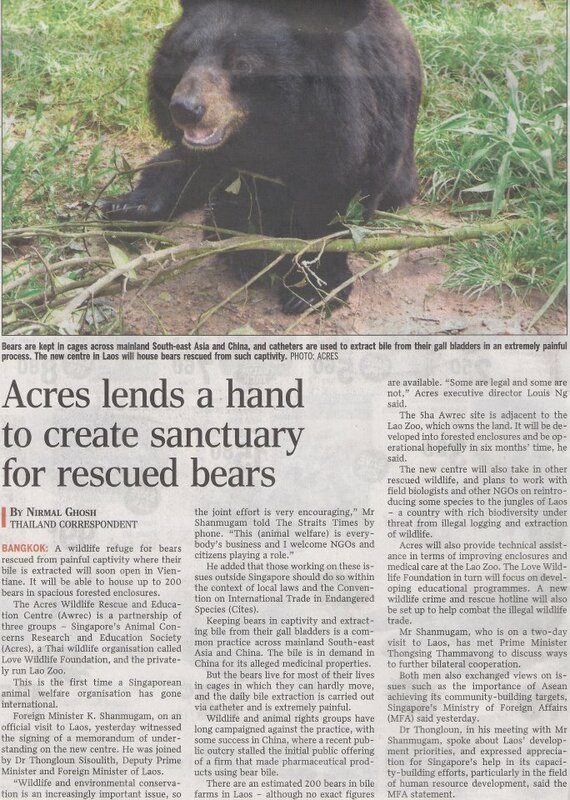 There are several Asiatic Black Bears as well as Malayyan Sun Bears waiting to be rescued and released. You can help by direct donation to the project or when you buy products with our “Love the Bear” logo. Love Wildlife has ceased operation in Lao P.D.R. Since September, 2017.